When the United States went to war in 1941, a lot of people immediately signed up to serve their country. After all, they were Americans and their country was now in peril. And so millions of Americans went to war to fight to defend the freedoms they enjoyed so much. African Americans signed up to defend their country as well, but things weren't quite the same for them. Instead of receiving the honor and respect they deserved, African Americans faced the same discrimination and segregation in the armed forces that they had lived with in civilian life. And, naturally, they were given the lowest jobs available. In the Navy, that usually meant serving in the mess as a cook or being on permanent clean up detail. But in 1943, the Navy sent a group of African Americans to Port Chicago in northern California. There, they loaded huge cargoes of ammunition onto waiting ships. The men immediately noticed that only African Americans were doing this potentially dangerous job, although they had to be supervised by white Naval officers, since the Navy didn't have an black officers. Then, on July 17, 1944 at 10:18 PM, as a second shift of men were loading the ammunition, an explosion occurred that was felt for miles around and which killed 320 men instantly. Among that number were 202 African Americans. At first, everyone thought the explosion was an enemy attack, but they soon realized what had happened. A few weeks after being moved to another port, the surviving men were ordered back to loading ammunition. Afraid of what had happened to their friends at Port Chicago, 258 African American sailors refused to obey the order. In fact, they were willing to obey any other order, but that one. After being told to pack their gear, they were crowded onto a prison barge. Eventually, most of the men would return to their jobs. In the end, 50 sailors would be charged with mutiny and court marshaled. And in the trial that followed, they would be found guilty, even though it was clear that the trial was biased, the judge taking the word of the white officers over that of the black sailors. NAACP lawyer Thurgood Marshall watched the trial closely and when the guilty verdict was announced, immediately started preparing an appeal. And though the appeal was not successful, the 50 sailors were eventually returned to active service, though they carried the stigma of mutiny throughout their lives. And yet, Steven Sheinkin contends, these 50 sailors did more for changing the civil rights of African Americans serving their country than they are given credit for, eventually helping to remove the practice of discrimination and segregation in ALL branches of the armed services. Sheinkin has done it again. First with Bomb: the Race to Build - and Steal - the World's Most Dangerous Weapon, now with The Port Chicago 50: Disaster, Mutiny and the Fight for Civil Rights. The moment I started reading it, I couldn't put it down. Sheinkin has once again written an exciting nonfiction narrative about a little know part of American history. In The Port Chicago 50, he brings to life many of the men involved, especially Joe Small, whom the Navy considered to be the ringleader of the mutiny. You will meet other unforgettable men in this book, some heroic, some a bit scoundrelly. But they will all rivet you to their story. As with all good nonfiction, there are plenty of photographs throughout the book, along with the names of each of the 50 sailors listed in the front matter. Back matter includes extensive source notes, as well as works cited, a list of oral histories and documentaries used and the records of the U.S. Navy regarding the Port Chicago explosion and subsequent trial. 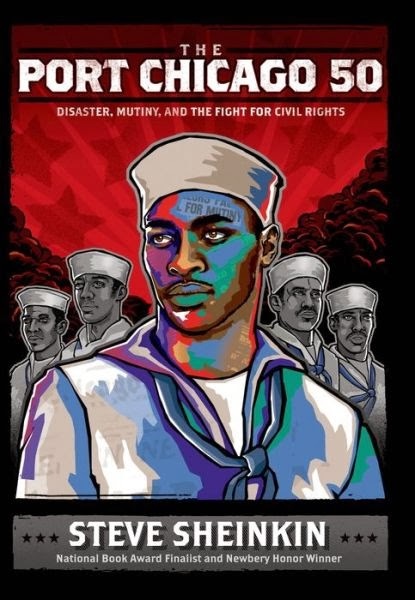 The Port Chicago 50 is a well written, well documented addition to the history of African Americans, their history of the Navy and the history of Civil Rights and a book not to be missed. I knew nothing of this. It's unnerving to recognize the depth of our discrimination at a time we were fighting to stop abuses against people groups in Europe. I thought the cover was stunning as well. Up close, it's even better. It never ceases to amaze me how this country treated Aftrican Americans and people of Japanese descent at a time they were willing to fight to defend basic civil rights they were deprived of. This is definitely your kind of book, Joyce.